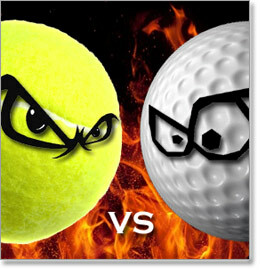 Tennis vs. Golf? Why would anyone want to pit these sports against each other? The idea isn’t to compare tennis to golf so much as it is to compare tennis to the most popular individual-player sport in United States. That just happens to be golf, so that’s the sport I’ll be comparing it to. With the growth in popularity of the NBA, NFL, and golf, combined with poor marketing strategies of the USTA (United States Tennis Association), kids in the US have less exposure to tennis than in previous decades. As a result, there are fewer US players at the top of the sport, which creates a snowball affect to the decline in popularity. The purpose of this article is to show people who haven’t been properly exposed to tennis why it’s such a great sport. If you’re at the point where you’ve grown up and stopped worrying about what your friends think, you might find this to be the most fun sport you’ve ever played. Combined with the poor economy and high obesity rates in the United States, there’s never been a better time to start playing tennis. While completely different in the way they’re played, tennis and golf also have a lot of similarities. They’re both individual-player sports where the results rest solely on that player. Also, tennis courts and golf courses are located in most cities across the United States, making them easily accessible to almost anyone. In basketball, if the hoop is low enough, a kid is going to make a shot now & then no matter how bad they are. In peewee football, soccer, and baseball, it’s a gradual learning curve where players improve on little things along the way. These small successes encourage people to keep playing. In tennis and golf however, until you know how to swing the racket or golf club, nothing happens. No parent wants to sit on hole #1 for ten hours while their 6 year old whacks it around four yards at a time. With tennis, it’s even worse. Who wants to hit a ball to someone who can’t get it back over the net? Worse yet, who wants to be the idiot who can’t get the ball over the net, forcing their friends to pick up balls they’ve spewed all over the court? In both of these sports, new players are likely to give up before giving them a real chance. In tennis, the main challenge is to consistently hit the ball over the net. In golf, it’s to make the ball go in the general direction and distance you’re aiming at. Without proper coaching, it’s difficult for new players to find a level of success that keeps them motivated to continue playing. However, a coach can teach the basics of a proper swing (in both sports) in a relatively short amount of time. This develops good habits, and more success early on. Once players can accomplish that first goal with some level of consistency, these are very fun & challenging games to play. If you’re thinking about picking up a new sport or to get your kids into something active, please continue reading. Since this is a betting site, I guess I should also mention that tennis betting is a lot more fun than golf betting. Both offer futures bets for the major championships months in advance, but the game-day bets in tennis are more fun. Of course the standard types of end-result bets are offered, along with a wide variety of prop bets. Live betting in tennis is fun as well, as the sport seems almost designed for this purpose. There is nothing more raw and exciting than the mano y mano type of competition in tennis. When you have to beat another person in a physical & mental challenge, most people find this more rewarding than a challenge where the competitor is only a competitor because you called them one. In golf, your buddy is your competition because you’ve agreed that you were competing. Whether your friends are on the golf course with you or not has little to no impact on your score, which proves that the competition exists solely in our heads. Sure, there may be added pressure to perform when it feels like something is on the line, but this is a mental thing inside your own head. Your buddy can’t stop you from making a good shot or cause you to make a poor shot. The shot you make is solely upon you. While his shot may change the strategy you take on your shot, your ball isn’t moving or spinning off the fairway when you swing at it. It is still about hitting a ball that sits in the grass. In tennis, your opponent is playing against you and his skill level has a direct impact on how well you perform. Tennis players need to outsmart each other, expose weaknesses, hit harder, and come up with big shots on crucial points. The way he hits the ball affects how you hit the ball, and vice-versa. Tennis requires that players athletically and mentally beat another person – a person with the same ugly (and beautiful) intentions as you. While we can be proud of what we’ve done on the golf course, it’s not the adrenaline rush we can get on the tennis court. Whether it’s the economy, saving for college funds, or just a pile of bills on the table, most of us are looking for ways to save money these days. In comparison to most sports (not just golf), tennis can be very inexpensive. For new tennis players, only a few inexpensive pieces of equipment are needed. When you’re just learning how to play, there’s no need for an expensive racket. A decent beginners racket can be bought at Target or any big box store for around $15-$20. A few cans of tennis balls cost around $10. I also recommend buying a roll of grip tape to provide better grip on the racket, especially when your hands get sweaty. This costs about $3-4. If you have a pair of sneakers, you’re ready to play for a total of about $30-$35 per person. Most cities have public tennis courts that are free to play on. To find courts in your area, type ‘tennis courts in (your city)’ into Google. Often times, people will find free, public tennis courts close to home that they never knew existed. Tennis courts tend to be tucked away into mountains and parks where they can’t be seen from nearby roads. There might be courts just a few blocks from where you live – ones you never knew were there. How does that compare to golf? A used set of golf clubs can be bought at garage sales or online, but it can be difficult to find the right sized clubs. Another option is to go to a store that offers used clubs for sale, like Play It Again Sports and many golf shops. At these types of stores, a set of used clubs can range in price from $50 to $300, and we’re just getting started. You may or may not feel the need for spiked golf shoes. You’ll probably want at least one glove. You’ll need golf balls (which can be spendy), tees, a golf bag (if it didn’t come with your clubs), and green fees. Oh, the green fees. At municipal courses, the minimum cost for a round of 18 holes is usually $15-25, and can go much higher. These are prices based on walking, not using a cart. If you want a cart, of course that costs more. If you’re concerned about green fees, then you don’t even need to know the cost of private courses. Put it this way, one round of golf at a private course can cost you more than equipping a family of six with all their tennis gear. Want to practice your golf game? Every time you want to hit a bucket of balls or work on your short game, this will cost you more money. If you don’t have a lot of money, golf is not the sport for you or your children. If/when you become a good player and you want the best equipment, the best tennis rackets can cost less than just the driver in a golf bag. A good tennis racket will cost in the range of $100-$200, plus the cost of re-stringing from time to time. Re-stringing usually costs $20 – $35, and most good players need to do this 2-8 times per year. Most people who play a lot of tennis also prefer a real pair of tennis shoes. These provide better support for the type of movement required on a tennis court, and a better playing experience. In contrast to golf, this is far cheaper than the cost of quality clubs, shoes, balls, cart & green fees. For anyone new to tennis, I definitely recommend getting some lessons. There are a number of ways to receive lessons, from free lessons on YouTube, all the way up to hiring former professionals. For new players, it’s best to get some hands-on training in person, with an actual racket in hand. Many cities around the US and the world offer free lessons through the park systems, usually in groups of 10-20 players at a time. This is a great way to get started, before taking the next step. From there, it’s a good idea to split a class with a local ‘pro’ (someone who instructs professionally). Most pros charge in the range of $20 – $100 per hour based on their own skill level and experience. The good news is, anyone who is coaching for money is a lot better than you, and even a $20/hour coach is going to greatly improve your game. To keep the costs down, split the class with 3-4 other beginners and now your costs are down to a few bucks per hour. You’ll get more one-on-one time with the instructor than you will in a large, free class, and the learning curve will go up very quickly. To find coaches in your area, type ‘tennis coach in (your city)’ into Google. Some tennis coaches will already have small groups that you can join and split the cost with. Also, many parks systems have websites & forums with other people looking to do the same thing as you. Of course before you do that, ask your friends & family if they’d like to join you. While the same types of lessons can be found for golf, this sport tends to require more one-on-one training (translating into more money spent in the long-run). Most new golfers will have little (or big) hitches in the way they hit the ball. To work out the kinks in a golf swing is much more difficult than to show someone how to swing a tennis racket. For new tennis players, once they get the hang of the swing, it’s more about repetition than making little adjustments. As far as I’m concerned, this is the best reason to start playing tennis. Tennis is a great way to burn calories while also having a lot of fun. Tired of mile after mile on the treadmill? Tired of the boring stair climber? Why are you doing them? My god, pick up a tennis racket and go have a fun work out! Unlike a treadmill, stair climber, or any other single piece of equipment people bore themselves on in the gym, tennis is a full-body workout. It requires side to side movement, front to back movement, arms, stomach, crouching, stretching, jumping, and running. Even better, it requires that we don’t go braindead while we play. Have you ever looked down at the clock on a treadmill and thought “oh my god, I have 40 more minutes on this stupid thing”? We all have, but it’s just the opposite when we play tennis. In tennis, we’re constantly thinking and keeping our brain going. How can I improve my backhand? How can I get more power on my forehand? How can I make my serve more consistent? When we’re playing an opponent, it gets us thinking about ways to beat them – strategically and physically. Maybe you run this guy all over the court and wear him down for the later stages of the match. Maybe you have to go for bigger serves. Maybe you realize he can’t handle your wide serves like he can when you serve down the middle. Maybe his backhand is inconsistent. There are a million things to think about when we play tennis, which makes the time pass very quickly. Before you know it, you’ve been playing for two hours and getting a high-intensity workout the entire time. This is how to get a workout! Golf gets us outside and moving, but the workout can’t compare to tennis. Even if you walk the course, the heart rate never gets into optimum fitness range. Want proof? Go to a golf course and see how many fat guys are playing. There are a lot of them. For the parents out there, what if your kids got addicted to a real game instead of a video game? Instead of sitting on the couch eating potato chips and hitting buttons all weekend long, what if they woke up excited to go play tennis? Of course this translates into better health & fitness, which snowballs into confidence and better results in the classroom. For the little kids, there are now mini tennis courts that can be set up on regular sized tennis courts, or any flat surface for that matter. For about $150, parents can buy a kit which includes a mini net and stands, plus lines to mark the court. Setup of the mini court takes about 4-5 minutes, and makes it easier for kids to find early success. As an kid born to active sports enthusiasts in Southern California, I was fortunate to be exposed to a lot of sports. Although I wanted to replace Ron Cey at third base for the Dodgers, I also loved football, tennis & golf. My parents were tennis addicts, part of a group that called themselves the ‘Brace Park Mafia’ in Burbank. In those days, summers were spent at Brace Park, riding skateboards and throwing rocks at my sister. We spent endless hours at the park, watching some of the best local players. We also took trips to various places around So. Cal., when my parents were playing in tournaments. My sister and I would also pick up a tennis racket now & then, but I was more interested in hitting tennis ball home runs. I started playing golf as kid too. My dad and I would go to DeBell Public Golf Course, and I played at Griffith Park with my uncle many times. I loved golf so much that I would pack my bag over my shoulder, and climb across several hills to meet friends at the course. As a kid, golf was my #2 sport behind baseball. In high school I played on the baseball team, while my best friend became the #1 ranked tennis player in California. For fun, my buddy and I would knock the tennis ball around the court when our official practices were over, and my love for tennis started to develop. I was a natural at tennis, and have always thought I could’ve done something in that sport had I taken it seriously from the time I was a kid. Over the years, I’ve fiddled with both sports for fun, and have become a big fan of watching tennis on TV. For many reasons, I’ve always thought tennis is a better sport than golf, and a sport that I think should be more popular in the United States.